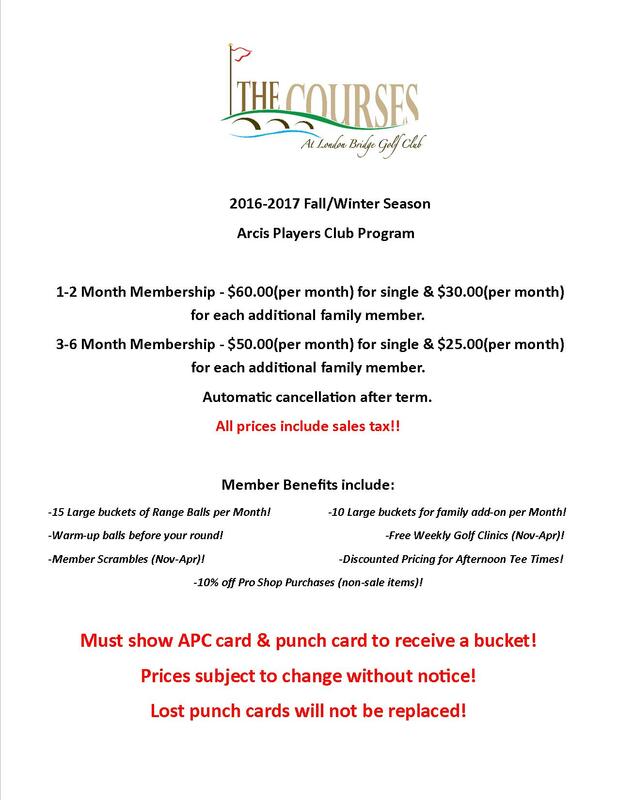 The London Bridge Arcis Players Club(APC) program offers anyone interested in the game a chance to improve without the anxiety that goes with learning while trying to play on the course. For one low monthly fee you will have access to our wonderful practice facility and all of it's amenities including a lighted driving range, receive unlimited range balls, visit as many times as you like for as long as you like and participate in complimentary clinics and play dates. Once you are ready for the course you will also receive a special afternoon rate. So, whether you are a beginner who wants to learn or an experienced golfer who wants to fine tune your game, this is an outstanding value for all! Please have your APC membership card with you while visiting the course. Without it, you will not be able to participate in the many opportunities this program provides. For private lessons, please contact Roman Garcia at 928-208-2654.